A stirring look at the early life of Johnny Cash, from his harsh but music-filled childhood to the first flush of stardom. There’s never been anyone like music legend Johnny Cash. His deep voice is instantly recognizable, and his heartfelt songs resonate with listeners of all ages and backgrounds. G. Neri captures Johnny’s story in beautiful free verse, portraying an ordinary boy with an extraordinary talent who grew up in extreme poverty, faced incredible challenges, and ultimately found his calling by always being true to the gift of his voice. A. G. Ford’s luscious paintings of the dramatic southern landscape of Johnny Cash’s childhood illuminate this portrait of a legend, taking us from his humble beginnings to his enormous success on the world stage. G. Neri is the author of Ghetto Cowboy, winner of a Horace Mann Upstanders Book Award. He also wrote Yummy: The Last Days of a Southside Shorty, which received a Coretta Scott King Author Honor, and Chess Rumble, awarded a Lee Bennett Hopkins Poetry Award. G. Neri lives in Florida. A. G. Ford has illustrated many picture books, including Goal! by Mina Javaherbin and Desmond and the Very Mean Word by Archbishop Desmond Tutu. A. G. Ford lives in Dallas, Texas. 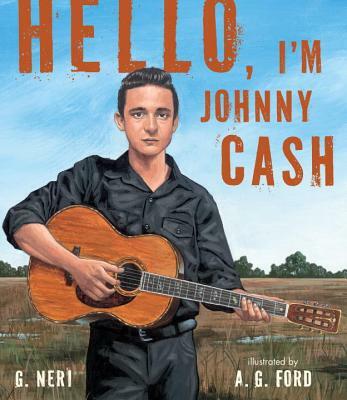 Even those who aren’t fans of musician Johnny Cash will appreciate the beauty of this biographical picture book. Written in free verse, with colorful, realistic illustrations done in oil, this title poignantly portrays the powerful influences of poverty, religion, family, and music on Cash’s life. ... This is a real tribute to the Man in Black, written in an easily accessible, engaging manner that demonstrates the qualities he possessed that make him a hero to so many. The narrative is well-researched, age-appropriate and beautifully expressive. The exquisite oil illustrations capture the setting and the emotion of each poem, allowing readers to feel as if they are there with J.R. as he works the harsh Arkansas fields or in the audience as Johnny whips the crowd into a frenzy plucking out his tunes on the guitar. An exceptional portrait of one of the most recognizable musicians of all time. Neri and Ford do an impressive job of painting a portrait of the Man in Black that emphasizes his hardscrabble beginnings and lifelong love of music. ... On each oversize, two-page spread, Neri’s straightforward free-verse lines describe a pivotal moment in Cash’s life that contributed to his love of music. Working in perfect concert with the words are Ford’s full-bleed, soulful oil paintings, which lovingly capture emotion—serenity in Cash’s beatific face when he sings along with the radio; rapture when he hears June Carter sing for the first time. ... Parents eager to share Cash’s signature boom-chicka-boom rhythms with their kiddos will appreciate this eloquent introduction to the iconic musician. Multiple columns of ragged-right-edge prose, rich in lyricism and boasting a driving cadence, deftly develop an intricate and detailed look at different moments and themes... Neri musters these elements together to track Cash’s musical develop- ment and reveal the encouragement, mentoring, and lucky breaks that bolstered his own determination to make it in entertainment. ... Kids unenthusiastically facing a biography report may find this to be a perfect balance of engaging reading and teacher-satisfying substance. The appealing biography succeeds in telling an information-packed story of one of country music’s greats: readers will feel they know the “Man in Black” well by book’s end. In free-verse poetry and images that recall the emotional directness of WPA murals and photography, Neri and Ford follow Cash from the grinding poverty and tragedy of his early years to the invention of his signature “boom-chicka-boom sound” and his breakthrough hit, “I Walk the Line.” The images consistently strike a haunting chord—especially a twilight scene on a country road in which Johnny hears his first song on the car radio (“John couldn’t believe/ that was his voice/ going out over/ the airwaves”). Readers will best appreciate this biography after hearing some of Cash’s music—and they won’t want to stop after hearing his story.